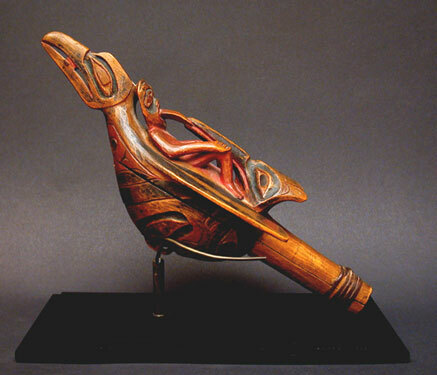 This dance rattle, of classic and elegant form, carved in two sections with cylindrical handle joined by three native wood pegs and bound with hide, is in the form of a raven in flight, its slightly opened beak holding a small "representation of the sun", the breast and underbelly displaying an exquisitely executed stylized totemic mask representing a hawk with openwork hooked beak in relief and incised formline details overall, red pigmented parted lips, and another set of eyes toward the handle. A shaman is reclining on the raven's back, his hands resting on bent knees, and the protruding elongated tongue projecting into the long, narrow beak of another highly stylized bird head forming the tail feathers of the raven, each figure with well-defined mask-like features with detailed ovoid eye reliefs. Red, black, and deep green native organic and mineral pigments are enhanced by a fine aged overall brownish patina. Carved by a master craftsman using the early and more primitive tools (perhaps an early form of the "crooked knife") that predated the more sophisticated tools used in the second half of the 19th Century. 1) From an American Museum Collection, bearing the Accession Number: 48.3.721. 2) The David Stuart Gallery, Los Angeles, CA in the late 1970s. 3) Private Collection, Southern California, since 1981.